An international team of astronomers has discovered that the nearby galaxy NGC 1277 was formed during the cosmic dawn and has remained completely unaltered since then. Its identification as a relic galaxy provides a unique window into the primitive Universe. 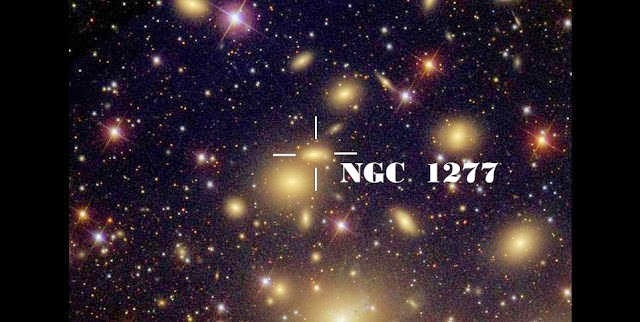 Researchers from the Subaru Telescope (Hawaii), the Instituto de Astrofísica de Canarias and the Universidad Autónoma de Madrid (Spain) have recently focused their attention on the nearby galaxy NGC 1277, located in the Perseus galaxy cluster, because it presented most of the main characteristics for being a relic galaxy of the early Universe: It is massive and very compact. They analyzed data obtained from the Hubble Space Telescope and from deep spectroscopic observations with the 4.2 m William Herschel Telescope (at the Roque de los Muchachos Observatory, La Palma, Spain) and found that the galaxy has remained unchanged from the time that the Universe was only two-thousand-million-years old, about 15% of its current age. For some unknown reason this galaxy remained isolated from its surroundings at that point and has not changed since then. It is a relic galaxy, suspended in time, and offers a unique opportunity to look more closely at the features of the early Universe. As principal investigator Dr. Ignacio Trujillo (Instituto de Astrofísica de Canarias, Spain) pointed out, "Due to reasons we don't know, the traditional sources of gas and stars that the rest of galaxies usually have were shut down for this relic galaxy. Therefore, this object was left without the flux of new material that forms stars and has remained as frozen in time." The discovery provides a new opportunity to study properties of the primitive Universe in unprecedented detail: its chemo-physical processes, its structures, and the dynamics that formed the very first galaxies and groups of stars. Researcher Dr. Anna Ferré-Mateu (Subaru Telescope, Hawaii) explained, "Finding a galaxy that has almost no interaction with the rest and that is so close to us means that we can study the properties of its form, its dynamics, and stellar populations with our current telescopes with a precision that would be impossible if we wanted to directly study the same object in the early Universe." Objects in the early Universe are so far away that it is difficult to detect any light from them. From the data that the researchers analyzed, they concluded that NGC 1277 is a very old, metal-rich galaxy, and it was formed in just a few million years. This conclusion implies that the production of newborn stars in the initial phase of galaxy formation was extremely high, around one thousand solar masses per year. Dr. Trujillo commented, "The data obtained indicates that the stars in massive galaxies formed much faster than we thought. If our measurements are correct, the star formation rates in the early Universe were one thousand times larger than those in our own galaxy now, where roughly one Sun form every year." This galaxy is also an object with amazing dynamics; it contains a super-massive black hole in its center. The stars located in its center move randomly, with velocities over 400 kilometers per second (km/s), at the incredible speed of almost one and a half million kilometers per hour; a rocket moving at this velocity would reach the moon in 15 minutes. The external region of this elliptical galaxy moves in a more orderly way, with stars rotating at velocities of 300 km/s. As Dr. Trujillo points out, "Usually the stars in galaxies do not present these two types of stellar motions at the same times with such intensity." This finding poses new, unimagined questions to be answered. Dr. Ferré-Mateu regards this research as just the beginning of more to come. She commented, "We are already working in a more detailed analysis with larger telescopes than the one used for this work, such as the 10.4 m Gran Telescopio de Canarias (GTC), in Spain, the largest in the world, and with the 8 m Gemini North telescope in Hawaii. This galaxy will also allow us to explore the capabilities of new instruments mounted on the 8.2 m Subaru Telescope, which is also based in Hawaii".